There’s an odd pattern that we’ve taken note of between otherwise disconnected items that the collective of mankind finds cute. At first, we were sure it was coincidence, so we experimented with a lot of different subjects to verify its truth. Who knew? Tiny things are just adorable. Would you like to have a 20 oz. bottle of water? Yes? How about a little and squished version of that with this tiny single serve 8 oz bottle!? Let us tell you that we have to dodge the masses running to grab that cute little thing! Of course, that’s the extreme. The more common adorable tiny thing comes in baby versions of already cuddy animals. What’s cuter than a dog or cat? A puppy or kitten. How about your favorite cartoon character? Make them chibi with giant eyes and snuggly little bods and we go collectively nuts for them. Well, how about something dangerous? How about this giant, ferocious, grizzly bear! … Yup. Cuddly li’l teddy bear cub just needs his little schnootz squished! So, we’ve decided to give one of the most frightening and enigmatic figures in cinematic history his day in the cuddleverse, too. 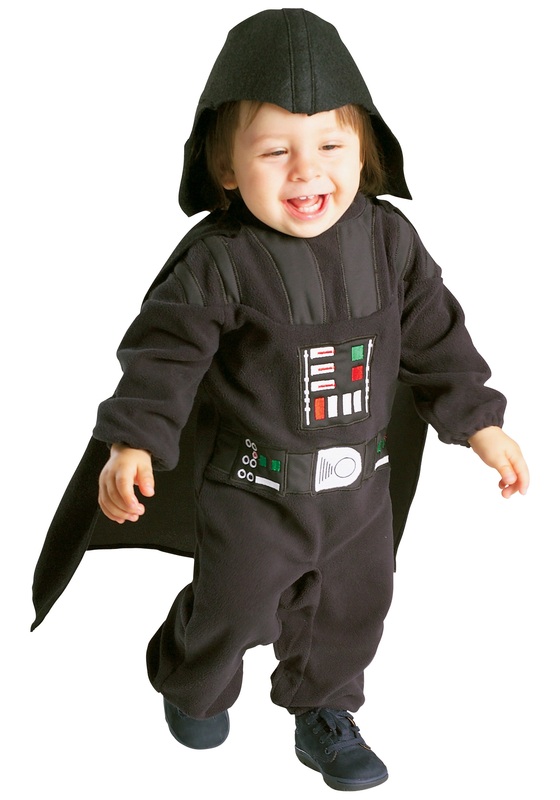 Be ready to absolutely fall in love with the dark side of the Force with this Toddler Darth Vader costume. A black polyester jumpsuit (complete with Velcro diaper access) has embroidered designs for the Squish Lord’s biomechanical control panels. The cape attaches with Velcro and the hard and intimidating helmet is even made snuggly worthy by being made of felt. May the Squee be with you!